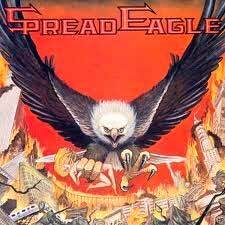 Spread Eagle are a heavy metal/hard rock band from New York whose sound is a mix of "Slave to the Grind"-era Skid Row and the sleazy shimmer and shake of Dangerous Toys. This band really had everything anyone could want from a sleazy, late 80's/early 90's band; the looks, the big label record deal, solid musicianship, smoking guitar solos, crunchy riffs and a vocalist with a nasty sizzle in his voice. Though it may sound trite to say after comparing the band to Skid Row and Dangerous Toys, Ray West's voice is a cross between Jason McMaster and Sebastian Bach. Overall Spread Eagle released a solid debut record. Had this been released a year or two earlier, I wonder if this band wouldn't have been much more popular.